Welcome to Boca Raton Colonics, our location has been servicing the greater Boca Raton with colon hydrotherapy for over 25 years. We are respected as the most experienced colonic clinic in the area specializing in gentle colonics using an advanced Hydro San closed system (the most popular system used) where an experienced colon hydrotherapist administers the session. There is no need to worry about getting infected by any harmful pathogens during a session since we only use disposable tubing and speculums that are only used once. Our water is purified through a state of the art filtration system that also uses UV light for further disinfectant. The colonic machine has also been enhanced with healing energy fields from High Chi Energy, making this one of the best colonics you will receive. 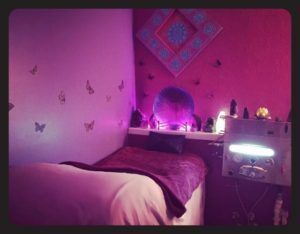 The therapy room is filled with many crystals along with The Miracle Scalar Energy Device to create the most healing and relaxing atmosphere. Colon hydrotherapy (a colonic) is a safe and effective method of removing waste from the large intestine by introducing filtered and temperature regulated water into the colon. The waste is softened and loosened, resulting in evacuation through natural peristalsis without the use of drugs or laxatives. Though relatively new to many, colonics date back nearly 5,000 years! The importance of colon health and cleansing has been well documented for thousand of years by many different cultures and civilizations. In fact many doctors were performing colonics on many of their patients in the early 1900’s before the pharmaceutical industry started. Giving PJ Braun and the body building team of Blackstone Labs their first colonics. Boca Raton Colonics has a 24 hour cancellation / rescheduling policy. If you cancel, change, or miss your appointment with less than 24 hours notice, you will be charged for the cost of the service. This policy is out of respect for the therapist and other clients who may have wanted your appointment time. Cancellations with less than 24 hours notice are often difficult to fill with short notice or no notice. By giving last minute notice or no notice at all, you prevent someone else from being able to schedule into that time slot. Thank you for your understanding and cooperation.